Interacting effectively with customers has traditionally been a form of art, especially in face-to-face settings. But now that customers are increasingly shopping on social media, mobile apps, and websites, a bit of science can help win their loyalty. How can retailers combine customer service expertise with advanced technology to create exceptional customer experiences? A successful strategy involves three interrelated elements: friction-free retail, personalized engagement, and enhanced in-store experiences. First and foremost, retailers need the tools to provide seamless and consistent engagement at every touchpoint – whether its social, mobile, chatbot, web, or in store. Over half of consumers browse on web or mobile apps before making an in-store purchase, and they expect to pick up on a new channel right where they left off. Cross-channel scenarios might include checking in-store availability online, returning online purchases to stores, choosing click-and-collect, or placing a home delivery order from a store. An integrated omnichannel solution enables retailers to easily manage cross-channel inventory and sales in one place, creating seamless experiences that foster customer satisfaction. Omnichannel solutions also track cross-channel customer activity in one place, giving retailers a deeper understanding of customer behaviors and preferences, which in turn drives wiser merchandising decisions. A holistic understanding of cross-channel customer activity lays the foundation for compelling personalization. Utilizing advanced machine learning technology to find meaningful patterns in customer data, retailers can recommend products targeted to a customer’s interests and buying habits. 77% of consumers have chosen, recommended, or paid more for a brand that provides a personalized service or experience. Furthermore, personalization isn’t just for digital channels anymore. Using IoT beacons to deliver real-time personalized offers and modern POS to surface tailored recommendations, retailers can create personalized in-store experiences. The in-store experience is an important differentiator, because over 90% of sales still take place in physical stores. Investments like IoT beacons, self-service kiosks, and mobile POS save time for both customers and employees and reduce customer churn. Imagine a customer sees a watch online, adds it to her wish list, and decides to visit a store to try it on. As she enters the store, she gets a push notification offering 20% off the watch on her list. A sales associate recommends a bracelet based on her past purchases, and she decides to check that out too. When she’s ready to go, she touches her phone to the POS tablet to pull up her payment information and completes the purchase without ever going to the register. Investment in in-store technology helps create smooth transitions from digital channels and exceptional shopping experiences. To drive seamless, personalized customer experiences using these advanced technologies, retailers need to start with a comprehensive, real-time understanding of customers and inventory. Microsoft Dynamics 365 for Retail is a true end-to-end omnichannel solution that delivers out-of-the-box analytics and full visibility into products, inventory, demand, and customers. Not only does it enable retailers to engage customers in innovative ways, but it streamlines business and data management activities. 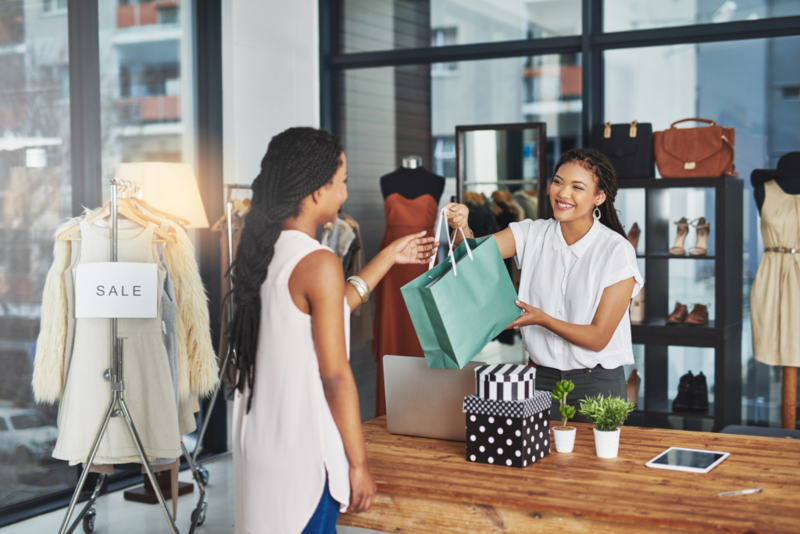 With an integrated and complete solution like Dynamics 365 for Retail, it’s much easier to create convenient, engaging, and rewarding shopping experiences.